Wichitans are debating the future of the Century II Performing Arts & Convention Center, pictured in the far right corner. It’s hard for me to picture downtown Wichita without the Century II Performing Arts & Convention Center. The blue-domed, spaceship-like building and I have grown up together. When I returned to Wichita after 21 years of living away, Century II remained a comforting reminder of my childhood Wichita. It felt like reuniting with an old friend when I watched a performance of the “Book of Mormon” or checked out the food booths at the annual Wichita Asian Festival. It came as a shock, then, last year when discussions intensified about razing the building and replacing it with a new performing arts and convention center. The landmark I saw was, to others, a relic that had outlived its usefulness. Several issues, such as the building’s age, its round design and the fact that the halls aren’t soundproof, make it less than ideal. But the issue proved divisive among Wichita residents, culminating in efforts to save the building and remodel it instead. Committees are still studying the issue, and there might be some resolution later this year or early next. My initial reaction put me in the Save Century II camp. I have a deep love for history and architecture. I can see how the building’s designers were influenced by the famous architect Frank Lloyd Wright, one of my personal favorites. But I also realized that Century II hasn’t been around forever, since it too replaced a previous arena that was deemed past its prime. So I’m trying to keep an open mind as I and my fellow Wichitans decide its future. What fascinates me about the Century II situation is that it’s a physical embodiment of the can’t-live-with-it, can’t-live-without-it quandary that exists so often in our communities. Kansans create something significant with the best of intentions – buildings, laws, businesses, economic systems. But over time, circumstances change, and we have to make tough decisions about what must be kept and what can be relinquished. It’s human nature to look for a win-win, but there’s no way to avoid a sense of loss while going through a process of adaptive change in a community or organization. Someone must say goodbye to something, whether it’s a beloved building, the desire to have an up-to-date convention center or something else. A decision has to be made that hurts someone’s interests even as it benefits others. The way to make such a loaded choice tolerable is to have leadership that elevates shared priorities. What exactly is it Wichitans want the future to look like when it comes to arts and convention amenities? What’s the process by which Kansans want to ensure their schools are suitably funded? 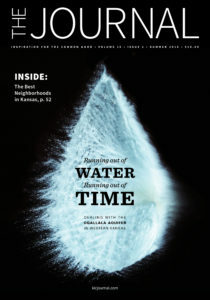 What do irrigators most want out of having access to groundwater in western Kansas? On these and other pressing difficulties, if Kansans can agree on a shared future they desire, then it can hold people together as they leave their existingpaths. Nothing can fully alleviate the pain that comes from loss, or the moral obligation for winners to grieve with others experiencing losses. But a common goal can make it easier to stomach giving up something in service of the future we can’t live without. Greatness, as the Kansas state motto argues so succinctly, comes not in spite of hardships but through struggle. But reaching the stars requires us to keep them in our sights. This entry was posted in Speak to Loss and tagged Adaptive Change, Century II, Loss. Bookmark the permalink.